Three years ago Taranaki sawmiller Tom Boon was unsure if his company Taranakipine would have a secure log supply over the long term following a change of ownership of Te Wera Forest, in east Taranaki. Boon's doubts were put to rest this week when China Forestry Group Corporation (CFG), which bought the 3500 hectare Te Wera Crown Forest licence in 2016, signed a seven year agreement to supply 100,000 tonnes of logs to Taranakipine. The agreement was boosted by a $1.9 million loan from the Government's provincial growth fund. About $1.8m of the loan would be spent on buying a new German-made fully automated processor to manufacture laminated floor and ceiling panels for export at the company's Bell Block site, north of New Plymouth. The agreement also meant employment for another 13 staff at the company, on top of the existing 170 workers. 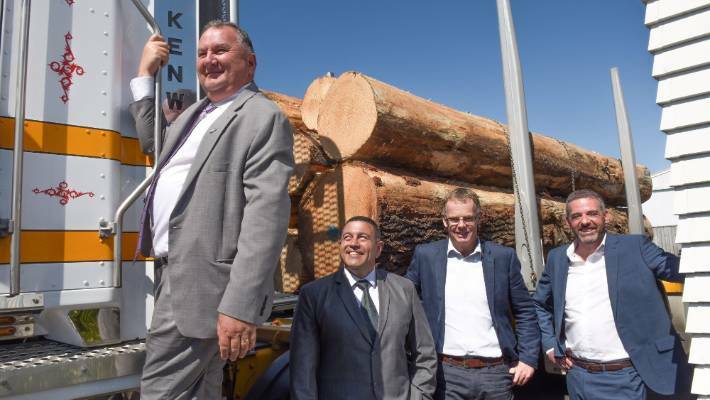 New Plymouth District Council mayor Neil Holdom said the agreement would see more logs coming to be processed at Taranakipine, and less being exported. Regional Development Minister Jones said he also wanted "decreasing amounts of logs going overseas." The $1.9m PGF loan was targeted for infrastructure and providing more work. "The decision is irreversible," Jones joked. "The only thing stopping it is Taranaki pig headiness trying to get a sweeter deal." In 2015 Boon said Taranaki was heading for a timber shortfall as forests planted in the 1990's were harvested and demand increased. The demand has increased since as export prices have climbed. This year Port Taranaki reported a record 42 per cent jump in log exports, to 692,000 tonnes annually, to boost its profits. "Log continuity is our number one concern as wood processor," Boon told a meeting, which included CFG chief operation officer Steve Walker. Boon said Taranakipine was established in 1982 to take logs from Te Wera but when forest ownership changed the company had no prior business relationship with either CFG, or forest managers, PF Olsen. Taranakipine's domestic and overseas markets, including Australia, Europe and USA, could increase with value added wood products from sustainably managed, renewable plantation forests, Boon said. CFG's partnership with Taranakipine showed the company's commitment to New Zealand, and how forestry owners and local processors can better work together, Walker said. CFG, is wholly owned by the China Government, and owns 24 forests in New Zealand, totalling 24,000ha of trees. Te Wera Forest represented 10 per cent of the company's NZ forestry assets. PF Olsen would continue to manage Te Wera Forest, and harvesting will be contracted to Stokes Logging, Northland, and Graeme Sole Logging, Taranaki. Stokes Logging owner Steve Stokes said the agreement was well timed for his company as the Northland log cut dropped off. The company would bring specialised equipment to work the steep terrain at Te Wera, which he described as "tiger country."